Read on to see all of the images. 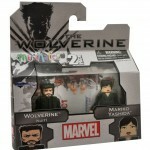 ComicBookMovie.com has revealed Minimates based on the upcoming Marvel film; The Wolverine. As is standard with Minimates releases, there will be two assortment. One assortment for comic/specialty shops, and one for Toys “R” Us.